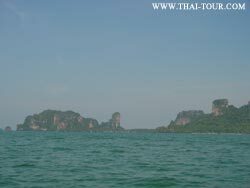 If I mention “Railay” to Thai people, not many ones know it, unlike foreign tourists. Railay was originally recognized as a little village of fishermen on the mainland, it’s not on an island. Due to its surroundings by limestone cliffs, people feel isolated from prosperity of the town and think of being on an island. How to get there: only by long-tail boats from Ao Nang or Ao Nam Mao or Krabi Town, if you come from Krabi. By a cruise, if you travel from Koh Phi Phi. Conservative tourists want to preserve this place as it is. So far there is no road access to Railay. 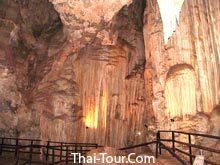 Only by boat, you can get there from Ao Nang or Ao Nam Mao (the shell fossil). Lastly I went here on 10 Apr 06 to explore any impact from Tsunami. It is opposite to what I expected. A lot of foreign tourists are walking along the beach, sun-bathing, taking a trip. All rooms are fully booked. Tsunami did not negatively affect here much. 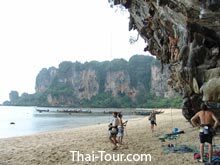 Contrarily due to limited accommodation in Koh Phi Phi (after Tsunami), tourists chose Railay as their destination instead. No photo need to be updated here as Railay has not been changed by Tsunami. Cliffs between Tonsai and Railay beaches are very interesting. It's suitable for a novice like me. Another attraction for the adventure lovers. You have to climb up and down. Some steps are too steep and you need to jump or tightly hold a rope. There you will find a lagoon. Find a post to Lagoon while you are trekking to view point. From my experience, this beach is the most beautiful, white sand, suite for swimming, sun bath, enjoy jogging, etc. The cave is at the end of the beach with a local tale about this cave (I cannot remember the story). 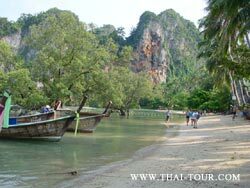 You can take about 15 minutes by walking from Railay Beach. Located behind Diamond Cave Resort. It's a part of Moo Koh Phi Phi and Nopparatthara Marine National Park. Path is good for visitors to walk through. Cave is pretty short for 10-15 minutes sight-seeing. 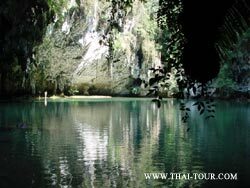 Don't miss if you come to Railay even though it is quite hard to find. It’s good for sun bath, swimming, sea canoeing, etc. It is the pier for tourists from Ao Nang. 9:00 am everyday, boat from Ao Nang will be stop for tourists for 10 minutes and leave for Koh Phi Phi. If you want to go to Koh Phi Phi you may book at counter of any resorts. Check out and be ready for the boat. 1- day trip is also available. Sea Canoeing is another popular activity. 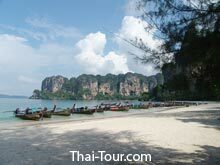 What are the recommended resorts: Railay Village, Railay Bay, Sand Sea Resort. Only three resorts are here. Sand Sea Resort; by beach, modern resort, and swimming pool (coming soon). Railay Bay Resort & Spa; by beach, many cottages and building units and swimming pool. Beach here is not suite for swimming as mangrove. Plenty of food shops, mini pub, near places of rock climbing. Three of resorts are recommended. Sunrise Tropical Resort, was open in late 2002, inexpensive room rate and not bad location. Railay Princess Resort, a sister hotel of Railay Bay, which has been built on the old resort, namely Yaya Resort. Anyavee Railay, a beachfront resort with a budget room rate, offering outdoor pool, private wooden bungalow under coconut tree. Diamond Cave Resort, with many new rooms, swimming pool on the little hill. Internet, food shops, tour package are available at the resort. A lot of changes here from the previous days. Bhungathani Resort, a more luxury beachfront resort, one of the most new brand resort in Railay East. Most of the rooms are a kind of villas. Find a good one suitable for you. Railay Great View Resort, the newest resort, 600 meters far away from the main area. The resort offers a great ocean view from your bedroom balcony. A prebooking of boat transfer is probably needed for this resort. Traveling is not much convenient and far from attractions, pier. But not far from food shops, boats, ATM, internet, etc. 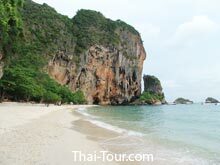 You may walk along the beach from Railay to Tonsai. Tonsai Bay Resort; by beach, many bungalows and a swimming pool is planed to be built soon. Popular activities includes rock climbing, sea canoeing, trekking, sight-seeing of islands e.g. 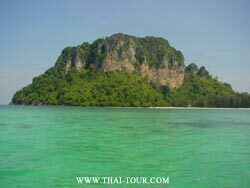 Koh Kai, Koh Thap, Koh Poda, one of Unseen Thailand. Railay is suite for the ones who love natural relaxation, escaping the ever-growing crowds, neither light nor sound like Phuket or Koh Samui. Shadow of limestone Cliff in the evening, while I'm watching the sun on the beach, is attracting me to return once again. 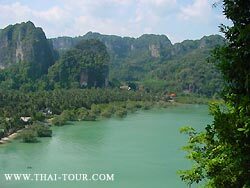 Another highlighted attractions are white sand beaches of nearby islands and viewpoint of Railay.